Astridestella.info: SMUDGING WHAT IS IT? AND WHY DO IT? SMUDGING WHAT IS IT? AND WHY DO IT? WHAT ARE FREE RADICALS AND ANTIOXIDANTS? SO YOU WANT TO SMOKE! WELLCOME TO: "Making the most of YOU"
In an earlier article I talked about Universal law, in order to understand why smudge you will have read about Universal Laws, if not click on the link below. * Everything vibrates, nothing rests. * Conscious awareness of vibration is called feeling. Your thoughts control your paradigms and your vibration (which dictates what you attract). Before you begin smudging to help attract positive energy around you need to de-clutter and clear out and tidy up. Any dead or dying houseplants/flowers have got to go. Empty bins and get rid of belongings that no longer serve you well, if you haven't worn it or used it for a year chances are you wont ever, so recycle it. Do the laundry, and tidy and clean your home, you can now smudge your surroundings. Some people like to have a regular schedule for smudging and you don't have to stop at homes, you can work on people (if they allow it) yourself and your possessions. It's a good idea if you feel the energy in your home has changed or you are feeling down to smudge. There are many methods and the traditional method is with sage and sweet grass and an abalone shell and with a feather. You light the sage and sweet grass bundle blow on it till smouldering and carry it in the abalone shell, this will induce smoke. The feather is used to waft the smoke to the areas you wish to smoke, remember you are dealing with a naked flame so be sensible and don't use it near combustible materials or gas sources etc. You can use incense Frankincense is ideal or a bell or even clap your hands if you have nothing available to hand. What is important is the intent. You are smudging to remove negative energy and attract positive energy in its place. With rooms, homes, after you have de cluttered and cleaned, in each corner of each room, either waft the smoke, ring the bell or clap and with your mind focused and with intent ask that the negative energy is changed into positive energy. The reason I say changed if you simply ask for the negative energy to be removed, you are moving it out into the atmosphere and sending it to someone else. You may find you have a bit of interference from Lower Elementals. The universe has its own vibration, Earth having the lowest in spiritual terms. After Earth comes the Astral realm, it is on this realm that we travel when we dream, its not unusual to see friends etc, in dream state, after all they will be traveling this realm too at night lol. It is on this realm where lower Elementals reside, i.e. wood nymphs, nature spirits, elves and fairies amongst others, and as often as in the case spirit who are trapped unable to move on also reside in this vibration. this is the same vibration used in psychic work. There are several spiritual realms each having a different vibration, with the most Celestial where the realms of the Angels are. These entities live in the lower astral realms and they feed on negative energy, like everything else there is balance in the Universe, cause and effect, good and bad, so obviously they do not like the shift in negative energy, so you may find light bulbs will blow, computers act up, it will pass, focus on the positive and visualise this positive energy flowing throughout your home. 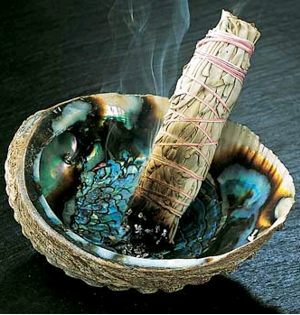 When it comes to smudging people and possessions its basically the same technique wafting the smoke around yourself and visualising covering you and washing and cleansing all the negative energy into positive energy, same with the bell, its often easier to get a helper to do this for you, remember the key is by thought and intent. If you use incense or sage and sweet grass be careful when dealing with flames. You should notice a difference almost immediately the atmosphere will feel lighter and you may get a sudden energy rush.